Nov. 18, 2017 8:30 a.m. 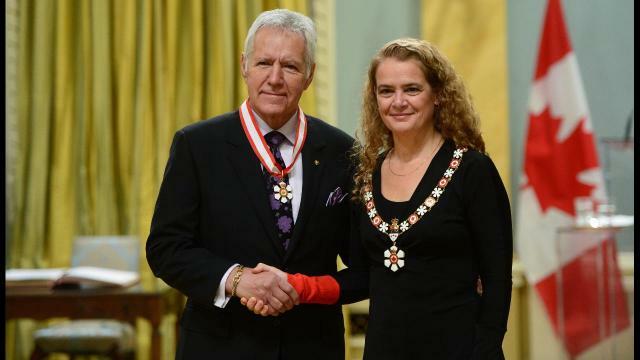 The Tragically Hip, “Jeopardy!” host Alex Trebek and former austronaut turned Governor General of Canada Julie Payette were among 44 Canadians introduced into the Order of Canada this week. The ceremony for the awards – known as the country’s highest civilian honor – were hosted Friday in Ottawa, and was the last one of the year. Jeopardy host Alex Trebek was recognized for his “iconic television work” and work on education and humanitarian causes. Tragically Hip members Rob Baker, Johnny Fay, Paul Langlois, and Gord Sinclair were also honoured. The band’s frontman Gord Downie died from brain cancer in October at the age 53. Before he died, he was honoured for raising awareness of Indigenous issues. On Friday, the group was recognized for cultural and environmental work. The newest group of recipients join a club of 6,897 other Canadians, including Christine Sinclair, two-time Olympic bronze medallist and captain of Canada’s national women’s soccer team, Dancing with Wolves First Nations actor Graham Greene and six-time Stanley Cup champion Mark Messier.